Ready to take your wellness wisdom — and career — in the next plane of success? This Certification Course with Practical Business Implementation is for you! Live the Wellness Career of your Dreams, Supported by the Lifestyle of your Dreams. This career upgrade experience is for wellness and health professionals who want to leverage their time by guiding groups through powerful life-changing experiences and step-by-step create an innovative career that leads to their income and lifestyle goals. That’s a lot. And that’s where we shine. You’ll learn from face-to-face, web-based live sessions AND comprehensive webinars that allows you to evolve your career fast - and from anywhere. When you’re finished with the first year, you’ll have already led your first dynamic group. There is a strong likelihood you will have earned your entire two-year tuition back, and be becoming a profitable, and more importantly, effective leader in your community. The second year you’ll enjoy the support of ongoing Live Sessions with Cate. You’ll focus on simple systems to sell out memberships to your coaching group. Plus, there is a strong likelihood you will earn your tuition back within the first year of the program, as the course experience is geared to your financial success as a coach. Cate Stillman is a thoughtleader in Ayurveda and habit evolution. You unlock a year of being in her Body Thrive Coaching Group to witness how she coaches in the online space. Your personal habits & health evolve. Part of our method is your integrity with your habits. Being around the other Coaches and Cate you'll seamlessly evolve your daily rhythm. The YHC Certification gives you an upgrade in your own personal habits first. Then you learn to coach a group, design your own program, and enroll and coach your program. You get business training alongside Ayurveda, Habit Evolution and and training on how to lead dynamic groups to better results. The lived experience of the two year programs leaves you with a complete upgrade of how you get people to results while living deeper into wellness wisdom yourself. In this way, we are hands-down the best health coaching certification available. You'll witness the positive power of influencers in our Paths to Leadership Mentoring and Tribe Growth model, which you'll be guided to recreate to grow your tribe and leadership within your Membership program for faster progress of your members. You learn step-by-step how to enroll your annual pass members for a significant investment. The median new coach starts enrolling at $750, and by the time they finish the 2 year training are enrolling at $2500. You get access to our templates, videos and email sequences which you have the option to use as part of your tuition, or generate your own. Then we guide you through automating your systems for success. Our global community is no joke. You'll be pulled into a dynamic group of colleagues who will support your career evolution. In our training you will step-by-step generate your unique Membership to be in your coaching group to begin immediately recouping your tuition investment. We make it easy. Who Learns Best With Us? Since 2012, we have guided beginner to expert wellness professionals to massive breakthroughs in their wellness career. It doesn’t matter if you have a big email list or a small, dedicated following, if you’d like to break six figures or just lead small local groups, work online or in person or both, we’ve got the fastest, easiest and best way to guide you to the next level of your wellness career. We even have nurses and doctors learn with us to gain a wider range of tools and experience with which to guide their patients to better wellness results faster. If you’d like to take your wellness career to the next level, as opposed to as opposed to just learning another modality training, then taking a course with Yoga Health Coaching is your next step. Power of Rhythm with Ayurveda. 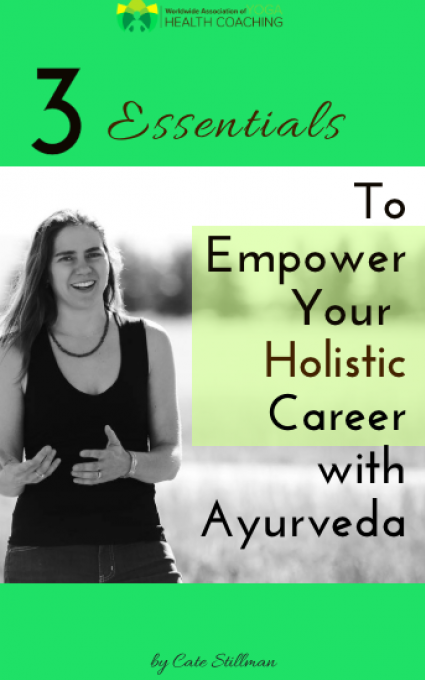 The first step in integrating Ayurveda into your career (and benefit by living the wisdom). How to simplify your holistic career to have a true wellness lifestyle and live in integrity with your deeper wisdom. Cate's secrets in leading her members through a better, faster, and more fun healing journey with Ayurveda. "Before I took YHC, I was struggling to make a living teaching yoga. I was determined what I love for a living so I decided to take the leap. and changing my life. I've tripled my income thanks to YHC." "YHC helped me learn Ayurveda through living the habits. This helped me be a better doctor, a better mother, and better in my own self care. Plus, you meet great colleagues! "Through YHC I was able to finally leave my full time job. Now I do what I love full time! And I'm able to work from home - which is great because I have a young child and I earned my investment back much quicker than I expected. Now I work 1/2 as much and am still breaking my income ceiling! Cate is an evolutionary thoughtleader, global tribe builder and author in the field of Ayurveda, Yoga and Dynamic Groups. She founded Yogahealer.com in 2001, and Yoga Health Coaching in 2012. She is renowned for helping wellness professionals evolve their personal health and their community impact.
" Holistic professionals should lead their communities to thrive with the wisdom of Ayurveda and the innovation of dynamic groups." For a limited time, you can get a free 30-minute Holistic Career Success Session with one of our Career Coaches. During the session - either via phone or web conference - we’ll uncover your career goals, your self-care goals and your core strategies to reach them. Then, based on your unique desires and skills, we’ll help you refine your plan if we can help you reach your goals, we’ll also let you know exactly how we can help you. We’ll uncover your unique skills and personality bring to the table for you in your wellness career… and customize a plan with simple next steps so that you can work with the most committed people (who can most use your help to hit their health goals on time) to get them to results in real time. And don’t worry - this is not a sales call - it’s truly a complimentary session. We love helping teachers, trainers and practitioners at all levels evolve their wellness career. So claim your Complimentary Wellness Career Success Session now. Take action now - availability goes - FAST! We promise - this is not a sleezy sales call. Schedule your complimentary Wellness Carreer Session now. 2019 Yogahealer. All Rights Reserved.